This triple crown 2012 Best Play winner -the Tony, the Pulitzer, the Olivier- is given a vivid staging at the Guthrie directed by Lisa Peterson. 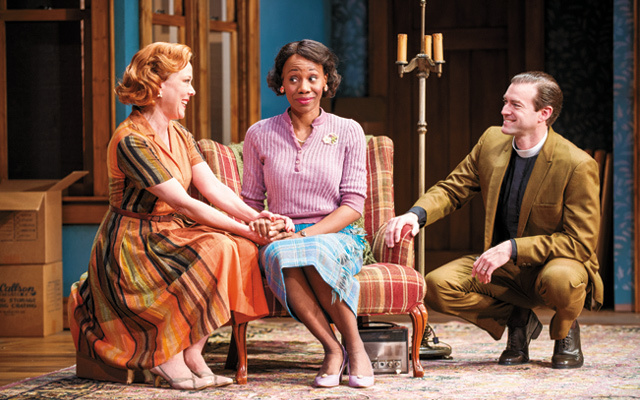 To be clear, you don’t have to know anything about the actual 1959 drama, Lorraine Hansberry’s A Raisin in the Sun, that playwright Bruce Norris has used as his inspiration, to fully enjoy Clybourne Park. It simply imagines the white married couple -Bev and Russ- moving out of the house that will soon be occupied by Hansberry’s black family, a couple that does not appear in the ’59 original. But Norris sets his play in that year – the year Raisin is set and was first produced. 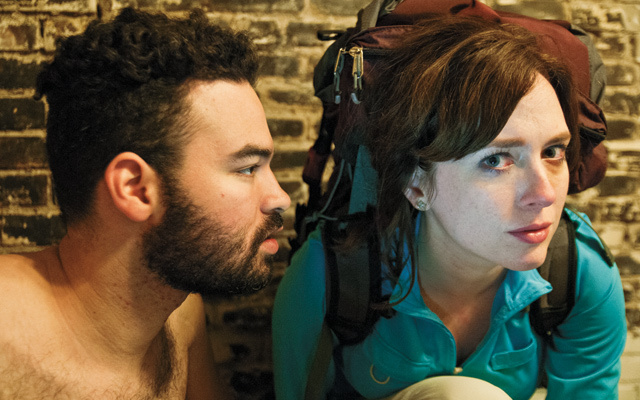 Guthrie regulars Kathryn Meisle and Bill McCallum as Bev and Russ capture Norris’s uncanny understanding of the limited consciousness most white people lived within during that time without becoming overly and glibly satirical. In other words, for all their naivete, as maddening as it is to us today, Bev and Russ are poignantly human. Norris underscores this by showing that the era’s limits and politesse have sadly hampered their ability to deal with the suicide of their son who had been stationed in Korea, as well as their ability to stand up effectively to the smugness of white neighbors who resent that they’ve sold the house to a family of color. Act Two imagines the house 50 years later when a diverse group of neighbors discuss zoning and building code issues. It’s an act packed with clever, witty, and sometimes refreshingly raw exchanges that challenge the politically correct way we often tend to communicate with one another. Compare it to high caliber television. It’s great for laughs, and even certain amount of insight, but it lacks the craft of Act One. Hence, it undercuts the moving final sequence which moreover, Peterson has not adequately explored. She sometimes has a discomfort with certain types of male characters: we saw it last year in her direction of Peter Hansen’s Brick in Guthrie’s Cat on a Hot Tin Roof and this year with Steven Lee Johnson’s take on Kenneth in Clybourne Park. Thankfully, Hansen, who now appears in Clybourne Park, is in top form in a transformational performance well directed this time around by Peterson. Now that we move beyond the cocoon of the marriage equality campaign, other issues that have long been brewing in the GLBT community are surfacing. These include Uganda, Bradley Manning, workplace discrimination, and as touchy as any of these are the negative attitudes held by many gays, lesbians, and some allies against others of gender and sexual ‘otherness’. Even some non-assimilationists are guilty of this. Immanuel Elliott and Cassandra Snow have comprised a collection of monologues and short scenes from submissions to Gadfly Theatre and from interviews. As cast member Patience Hughes explains “we wanted to showcase the common thread that binds those of us in the queer community and tell stories of people that you wouldn’t otherwise hear.” Titled Queer!, it premiered in early June at the National BECAUSE conference presented by BOP (Bisexual Organizing Project) and is now at St. Paul’s Lowry Lab. Playwrights Center, 2301 E. Franklin Av., Mpls. This wondrous new musical revolves around the idea that life is a game to be played and enjoyed to its fullest. A casino dealer named Ailments, charismatically played by Claudia Wilkens, is a sort of senior-ranking angel who metes out aches, pains, and debilitations to the aging. Richard Ooms, Wilkens’s real life husband, plays Louie, a curmudgeon, who like most of us would, tries to bargain with her. The chemistry between the two is marvelous and Ooms’s solo about Louies’s deceased wife, Twilight Savings Time, is very touching indeed. The genius of John Fenn’s script is that on one hand it’s light and airy as a feather, yet it’s a profoundly spiritual assertion that simple changes in how one personally sees what life and the world hand you can and will shift your life and consciousness to a better place. It’s an idea that’s been around for a while but has seldom been manifested so fully and richly in a stage work. Drew Jansen’s music and lyrics are quite simply his best ever. He and Fenn are on the same delightfully philosophical page with director Bain Boehlke. Phil Ross and Dee Noah are vibrant as a couple who has managed to maintain their optimism despite the pitfalls of aging. 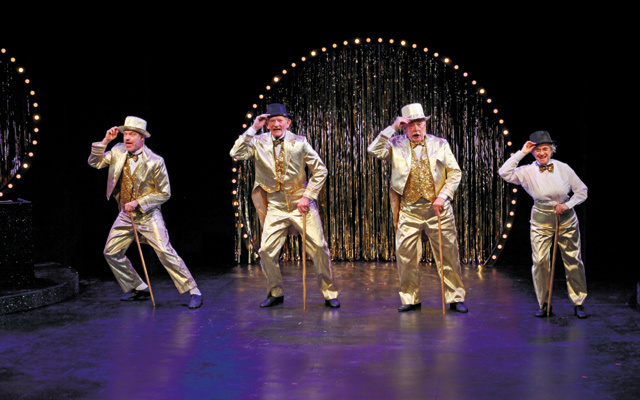 Wendy Lehr’s choreography nicely complements the show’s vaudevillian flair.